This is a classic communication problem: how do you communicate your value in a business setting? There is nothing servile about this. It’s a win-win situation, cliche though it is. The employer wants your talent/ability/work more than he wants his money, and you want the money more than you want to use your time for something else. If either of you doesn’t perceive greater value to yourself from the trade, then you will not make the trade. The key is to communicate your value, and you don’t do that by saying, “I’m valuable.” It begins with action – with actually being valuable. If you successfully communicate a lie, it won’t stand scrutiny for long. But unless you communicate the truth, no one will know you can solve their problems, or that your value is greater than your cost. 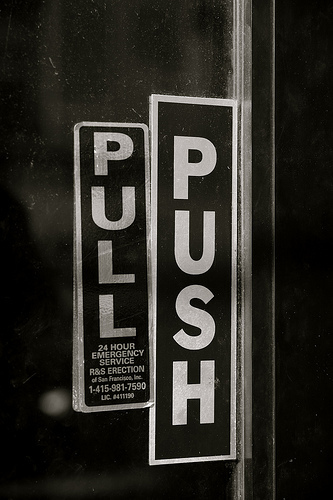 To put it in bumper sticker form: pull rather than push. As many have said, it’s not who you know, it’s who knows you and what you can do. How have you found this to be true? Have you discovered an effective way to communicate your value? Photo by Flickr user Robert S. Donovan. Rasmussen College has an infographic about the worth of a bachelor’s degree. What do you think about its insights? We originally had the infographic showing here, but they didn’t like that, so go there and take a look at it. At first glance this article would seem to have little to do with college, academics, learning, etc. In fact, it gets at the whole point of higher education, in my opinion. My students often here from me that college has never really been about preparing a student for a job; it is about helping a student learn to live more effectively (which, by the way, generally makes a student more attractive to an employer). As both my students and my children probably get sick of hearing: it’s not what happens to you but what you think about what happens to you that determines your experiences. Jonathan Fields says you’re working two jobs, like it or not. Given the state of the economy, this is good advice for graduates to keep in mind as they tackle the job market, whether getting a job or moving up. This blog is “not just academic,” as the flag shows. While we’re primarily interested in communication-related topics, and technology in higher education, we’re focused on application. Feeds show up in a couple of online classes, though, so I want to take an opportunity to post a link to an article that may spark some pragmatic solutions for students who worry about getting a job once they graduate, whether they’re journalism/PR folks or more general students who read this. It also happens to be a good example post for speech students to show how expressing an opinion goes beyond merely expressing it, but also illustrating it and backing it up. Columnist and consultant Peter Bregman tells CNN readers/viewers, “No job? Create your own!” Like anything else, it’s easier said than done. (Isn’t that true of everything? So why is that supposed to be a reason not to act?) The idea, or perhaps the attitude, is the value of this post.